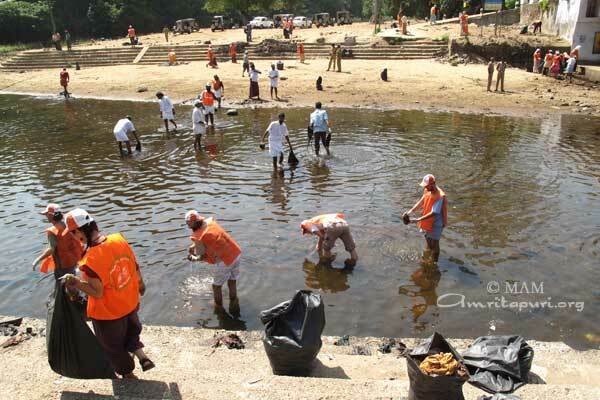 On March 25th and 26th Amala Bharatam (ABC) volunteers undertook the cleaning of the Pamba River at the Sabarimala pilgrimage site in Kerala. 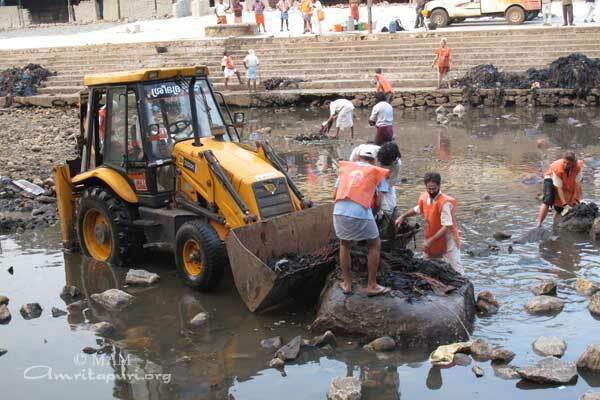 The request for the clean-up drive came from the District Collector P. Venugopal, who approached Amma on March 23rd, following an order of the High Court that the temple and river was to be cleaned before the world-famous pilgrimage site was to reopen for pilgrims on March 27th. 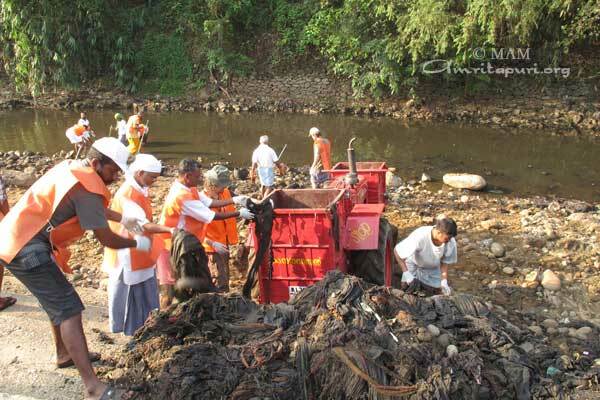 Around 175 volunteers from all over the world were working day and night, wading through the waters, removing countless pieces of discarded cloth, plastic and human waste. 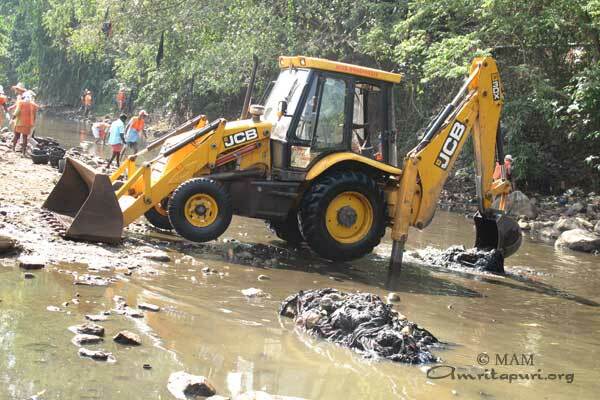 Three excarvaters and three tractors helped to collect and dispose of 98 truckloads of trash. 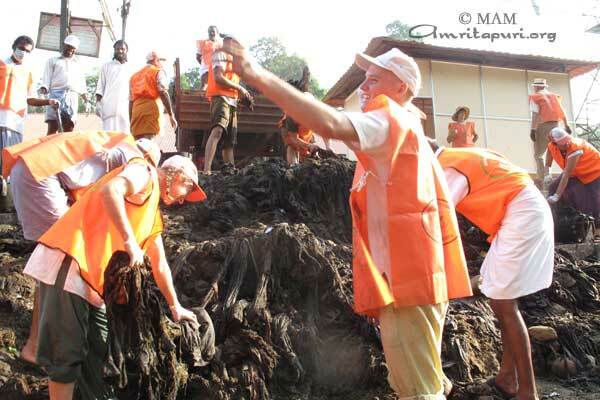 Sabarimala is one of the most significant Hindu pilgrimage sites in the world, with millions of visitors every year. 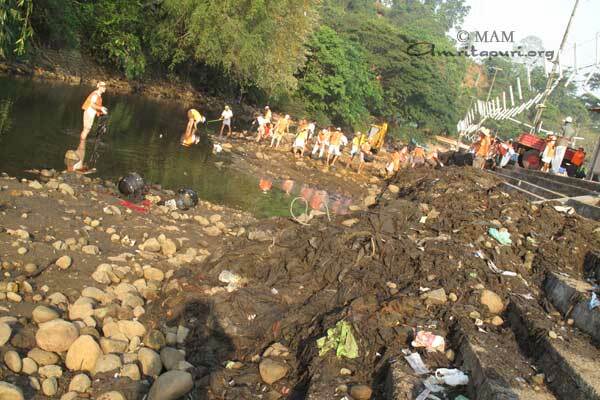 Before the pilgrims embark on their final climb up to the temple on top of the mountain, they traditionally take a purifying dip in the Pamba river. 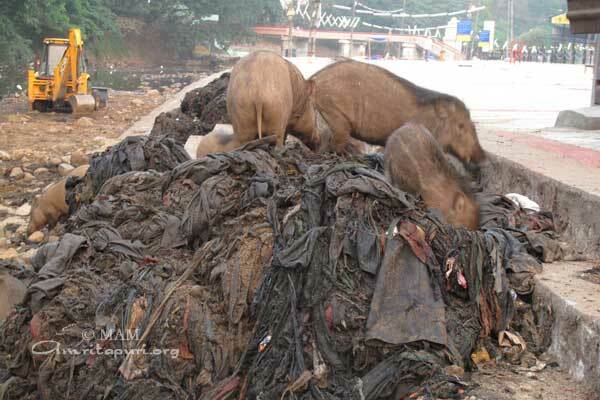 After they have offered their prayers at the temple they once again take a bath and thereby dispose of the black cloth and prayer beeds they had been wearing during their pilgrimage. Through this, they release themselves of the vow of celibacy that they had taken for 41 days. 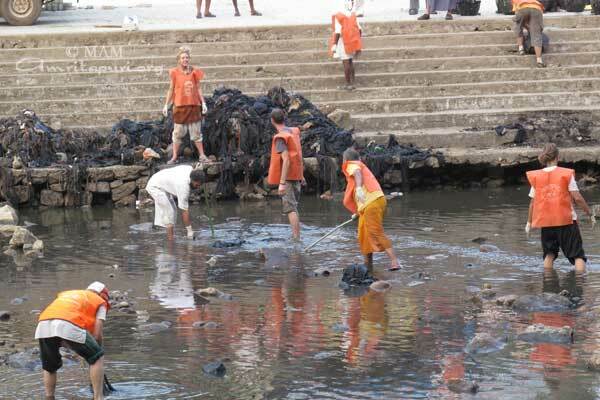 Given the large number of pilgrims one can imagine the amount of clothes that are discarded in the river. 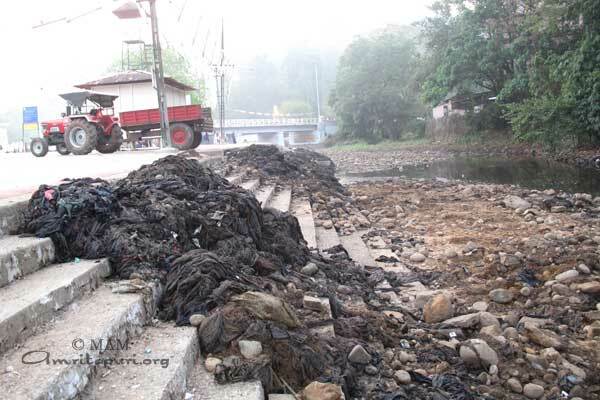 Even though most of the clothes on the surface of the water are being removed on a regular basis, the riverbed has never before been cleaned. 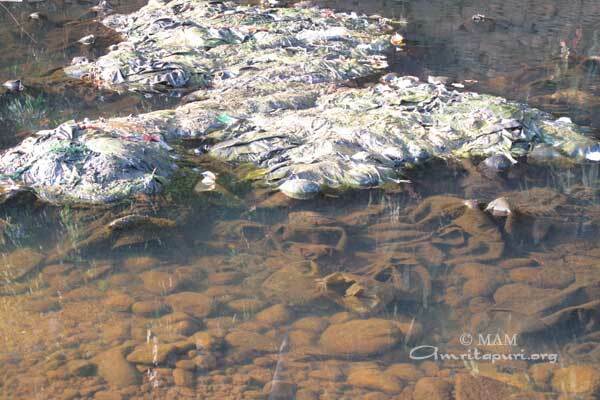 Due to the extreme pollution of the river it had become a very unpleasant experience for the pilgrims to immerse themselves into its waters. 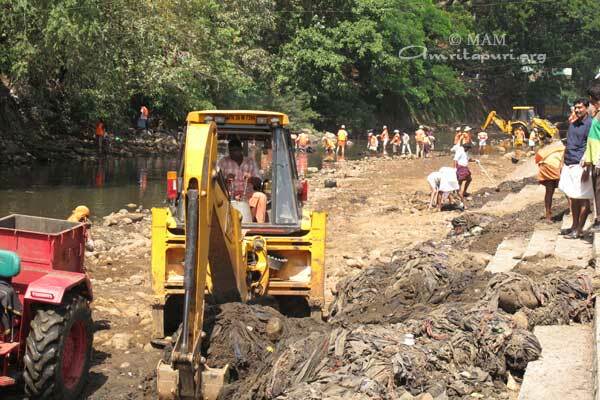 To facilitate the clean up process the flow of the river had been blocked by a dam, exposing the riverbed with countless clothes wrapped around stones and burried in the mud. 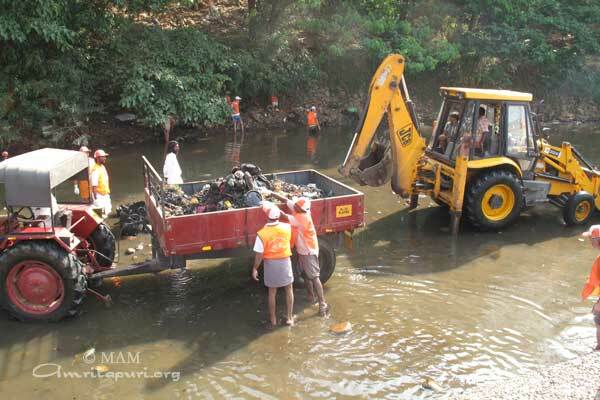 At first it seemed impossible to complete the task, since the heavy loads of wet fabric not only had to be picked up, but also carried up the banks of the river where they were loaded into the tractors for disposal. 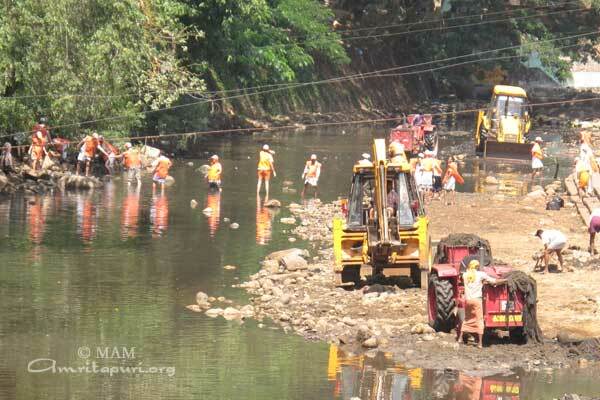 However, on the second day some of the volunteers had the idea to create an access road so that the tractors could drive onto the riverbed directly. 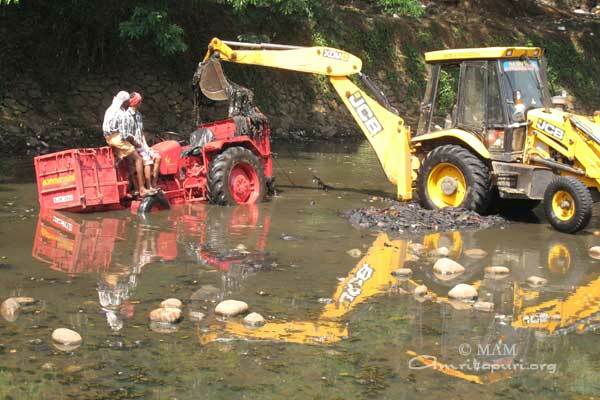 After two hours of paving a way for the tractors with huge stones the workflow became much faster, allowing very quick loading and unloading. 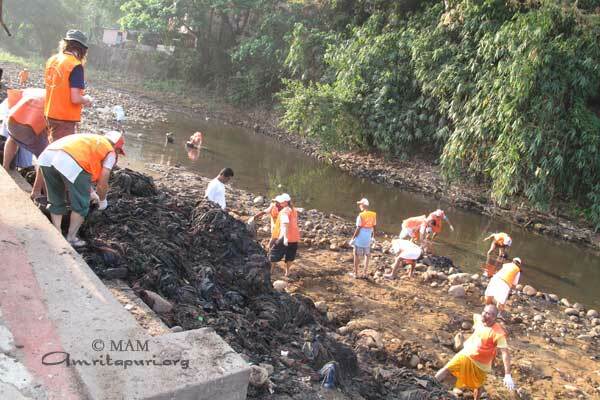 Even though the seva was very challenging, the volunteers were full of enthusiasm, dedication and cheerfulness from the early morning until late at night. 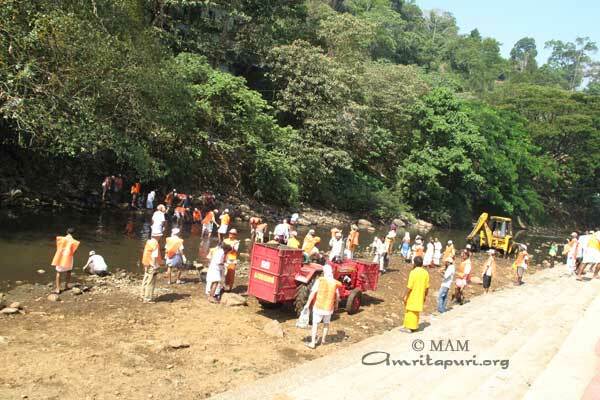 As the sun set, they joyfully started to sing bhajans with rakes, spades and buckets as instruments. 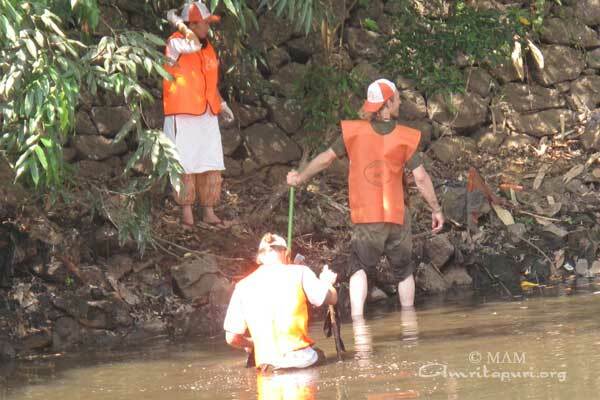 Some commented that it was one of their best experiences in a long time, giving them the opportunity to overcome their likes and dislikes and experience the joy of serving. 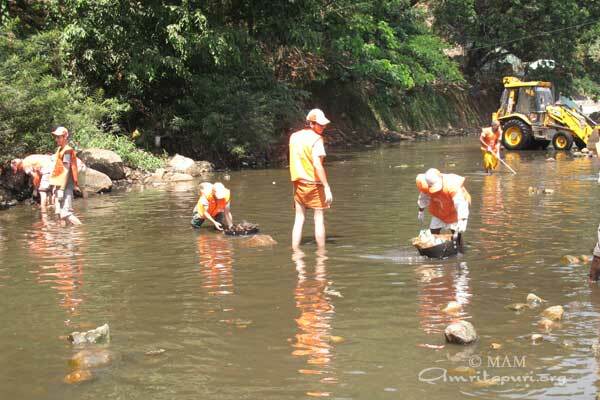 On April 5th, the traditional annual immersion of the Ayyappa temple idol in the Pamba river is going to take place. 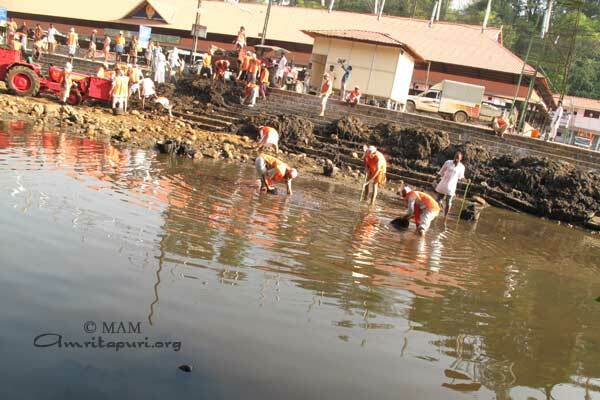 For the first time in years, this sacred ritual can be performed in clean surroundings, at the beautiful and serene banks of the Pamba river.